Tokneneng is a tempura-like Filipino street food made by deep-frying orange batter covered hard-boiled eggs. 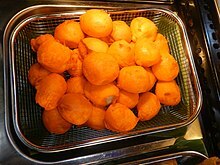 A popular variation of tokneneng is kwek kwek. The main difference between the two lies in the egg that is used. Kwek kwek is traditionally made with quail eggs, while Tokneneng is made with chicken eggs. Due to their similarities, the two are often confused with some people calling tokneneng "kwek kwek" and vice versa. Tokneneng is usually served with a spiced vinegar-based dip. The name "tokneneng" originated from the 1978 Pinoy komiks series Batute, illustrated by Vic Geronimo and created by Rene Villaroman. In the main character Batute's language, tokneneng means 'egg'. ^ Admin. (2009-01-22). Pinoy Street Food: Kwek Kwek or Tokneneng Recipe. Filipino Foods Website. Retrieved July 9, 2011. ^ Admin. (2013-09-29). Tokneneng talaga. clinquantlife Retrieved September 29, 2013.